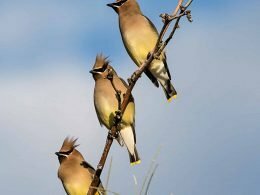 Cedar Waxwings are social birds that are most always seen in flocks. 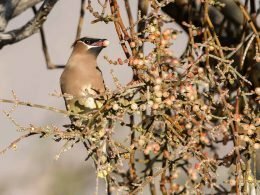 Cedar Waxwings are medium sized songbirds that are winter visitors to Sabino Canyon. They have a large head, short neck and a short, wide bill. 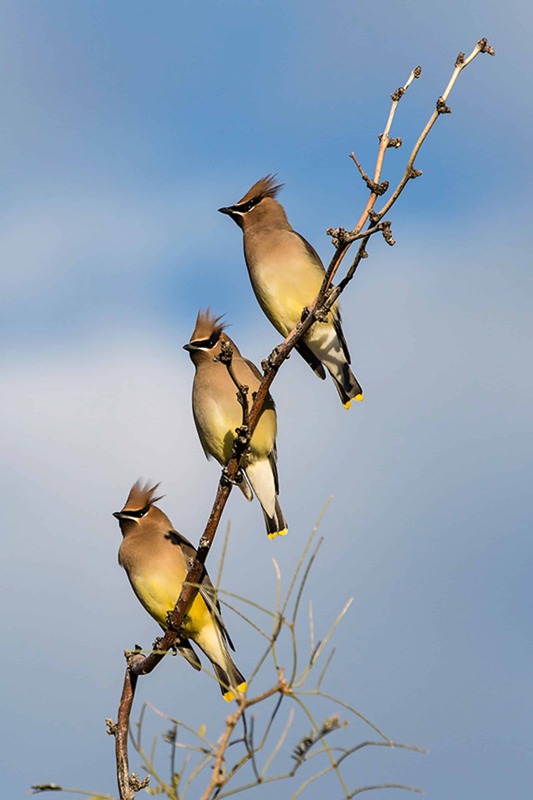 Waxwings have a crest that often lies flat and droops over the back of the head. The wings are broad and pointed like a Starling’s. They are named for the red wax like tips on the secondary flight feathers of adult birds. 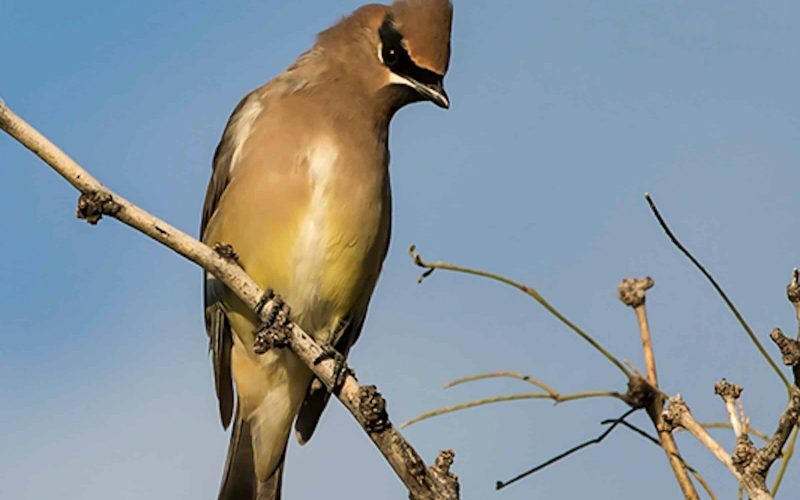 Cedar Waxwings are pale brown on the head and chest fading to soft gray on the wings. The belly is pale yellow and the gray tail is fairly short with a bright yellow square tip. The face has a narrow black mask neatly outlined in white. The wing feathers have red waxy tips that are not always easy to see in the field. They sit in fruiting trees swallowing berries whole, or pluck them in mid-air with a brief fluttering hover. 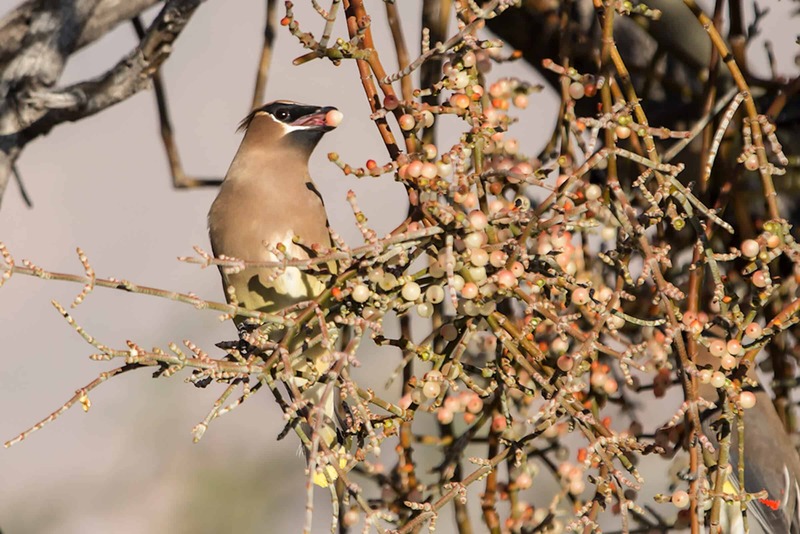 Individual Cedar Waxwings often pass fruit to one another as part of courtship behavior. They frequently wipe their bill on a branch while eating. They breed late in the year, coincident with the availability of summer ripening fruits. Voracious feeding on fruits by large flocks and a high degree of mobility make these birds an effective disperser of the seeds of fruiting plants. They move along branches with quick hops as they feed. They rarely venture to the ground. Short flights are direct with steady wing beats. In longer flights they alternately flap and glide. The author captured these images on January 10, 2015 in lower Sabino.